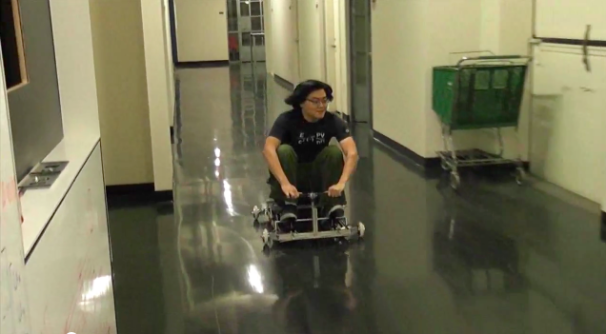 Now, the downside is that the kart uses a bunch of crazy parts, including a "not on the market" lithium-ion battery pack, an equivalent to which Charles estimates would cost between $250 and $400, and custom-modded in-hub brushless motors. Charles also shows up in the comments for this Gizmodo article on the kart with an impressively comprehensive set of links for understanding what he did and how to do it yourself, so while it's not a solder-up-a-kit sort of project it's also maybe not as impossibly daunting to replicate as it appears at first glance. It's awesome to see hobbyist electric vehicles becoming more of a thing -- the 21st-century equivalent of my cousins' gas-powered go-kart -- and it's not surprising that there's a growing body of specialist knowledge around how to wring the most power out of the available components. Nor is Chibikart the first such kart to come out of MIT--see for example tinykart (in-the-snow video! man that looks like fun) and MelonKart. Also, have a look at some electric kick-scooter mods and one of Charles Guan's previous projects, the LandBearShark, a tracked skateboard (!!!). Being MIT students, there's some serious data-crunching going on as well. Some of these devices are built for class projects, some just because -- all are awesome. With smart people like these on the case (and maybe you too? ), peak oil won't be so bad after all.